In contrast to the classical books which largely focus on separate, individual physicochemical and biological aspects, this book aims to integrate the frontiers of knowledge on the fundamentals and the impact of physicochemical and biological interactions and processes of AOCs in soil, sediment, water and air. 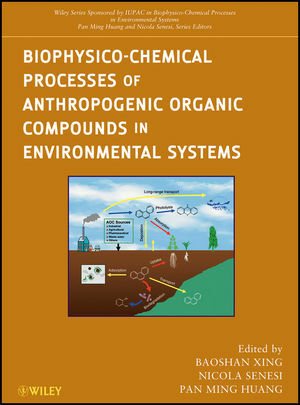 The specific objectives of this book are to address: (1) fundamental biophysico-chemical processes of AOCs in the environment, (2) occurrence and distribution of AOCs in air, water, and soil, and their global cycling, (3) the state-of-the-art analytical techniques of AOCs, and (4) restoration of natural environments contaminated by AOCs. The book also identifies the gaps in knowledge on the subject matter and as such provides future directions to stimulate scientific research to advance the chemical science on biophysico-chemical interfacial reactions in natural habitats. By virtue of complex nature of the interactions of AOCs with different environmental components and matrixes, no single available technique and instrument is satisfactory yet for determining their fate, transport, availability, and risk in the environment. In order to fully understand the biophysico-chemical interactions and processes of AOCs in the environment, it is critical to know chemical, physical and biological properties of AOCs and their analytical techniques. The book is unique because of its multidisciplinary approach as it provides a comprehensive and integrated coverage of biophysico-chemical reactions and processes of AOCs in various environments, associated analytical techniques, and restoration of natural environments contaminated by AOCs. Baoshan Xing is Professor of Environmental and Soil Chemistry in the Department of Plant, Soil, and Insect Sciences, University of Massachusetts Amherst, where he has been actively involved in teaching and research since 1996. Dr. Xing received his PhD from the University of Alberta, Canada, in 1994. His research work ranks in the top 1% of cited authors for journals in environmental sciences and ecology. Nicola Senesi is Professor of Soil Chemistry and Head of the Department of Agroforestal and Environmental Biology and Chemistry of the University of Bari, Bari, Italy, where he has been actively involved in research and teaching (as research assistant, assistant professor, and associate professor) since 1969. He was conferred a Doctorate Honoris Causa by the Institut National Polytechnique de Toulouse, France, in 2000. The late Pan Ming Huang received his PhD in soil science from the University of Wisconsin–Madison. He was Professor Emeritus of Soil Science at the University of Saskatchewan, Saskatoon, Canada. His research work has significantly advanced knowledge on the formation chemistry and the nature and surface reactivity of mineral colloids, organic matter, and organomineral complexes of soils and sediments and their role in the dynamics, transformations, and fate of nutrients, toxic metals, and xenobiotics in terrestrial and aquatic environments. PART I FUNDAMENTAL BIOPHYSICO-CHEMICAL PROCESSES OF ANTHROPOGENIC ORGANIC COMPOUNDS IN THE ENVIRONMENT. 1 Interactions of Anthropogenic Organic Chemicals with Natural Organic Matter and Black Carbon in Environmental Particles (Joseph J. Pignatello). 2 Comprehensive Study of Organic Contaminant Adsorption by Clays: Methodologies, Mechanisms and Environmental Implications (Stephen A. Boyd, Cliff T. Johnston, David A. Laird, B. J. Teppen and Hui Li). 3 The Role of Organic Matter-Mineral Interactions in the Sorption of Organic Contaminants (Myrna J. Simpson and Andre J. Simpson). 4 Photocatalytic Degradation of Organic Contaminants on Mineral Surfaces (Chuncheng Chen, Zhaohui Wang, Wanhong Ma, Hongwei Ji and Jincai Zhao). PART II ANTHROPOGENIC ORGANIC COMPOUNDS IN AIR, WATER, AND SOIL, AND THEIR GLOBAL CYCLING. 5 Sorption of Anthropogenic Organic Compounds to Airborne Particles (Hans Peter H. Arp and Kai–weU. Goss). 6 Measurement and Modeling of Semivolatile Organic Compounds in Local Atmospheres (Songyan Du and Lisa A. Rodenburg). 7 Pharmaceuticals and Personal Care Products in Soils and Sediments (Bo Pan and Baoshan Xing). 8 Fate and Transport of Organic Compounds in (to) the Subsurface Environment (Peter Grathwohl). 9 Pharmaceuticals and Endocrine Disrupting Compounds in Drinking Water (Daniel W. Gerrity, Mark J. Benotti, David A. Reckhow and Shane A. Snyder). 10 Intermedia Transfers and Global Cycling of Persistent Organic Pollutants (Claudia Moeckel and Kevin C. Jones). 11 Emission of Polycyclic Aromatic Hydrocarbons in China (Shu Tao, Bengang G. Li, Yanxu X. Zhang and Huishi Yuan). 12 Principles and Guidelines of Sampling, Extraction and Instrumental Analysis Techniques for Measurements or Organic Pollutants in Environmental Matrices (Eddy Yongping Zeng, Zhaohui Wang and O. Samnuel Sojinu). 13 NMR Application in Environmental Research on Anthropogenic Organic Compounds (Robert L. Cook). 14 Synchrotron-Based X-Ray and FTIR Absorption Spectromicroscopies of Organic Contaminants in the Environment (John R. Lawrence and Adam. P. Hitchcock). 15 Application of Solid Phase Microextraction in Determination of Organic Compounds from Complex Environmental Matrices (Sanja Resticevic, Dajana Vuckovic and Janusz Pawliszyn). 16 Application of Biosensors for Environmental Analysis (Marinella Farré, Sandra Pérez, Lina Kantiani and Damiá Barceló). 17 Analyses of Drugs and Pharmaceuticals in the Environment (Imran Ali, Hassan Y. Aboul-Enein and Klaus Kummerer). PART IV RESTORATION OF NATURAL ENVIRONMENTS CONTAMINATED BY ORGANIC POLLUTANTS. 18. Biochemistry of Environmental Contaminant Transformation: Nonylphenolic Compounds and Hexachlorocyclohexanes – Two Case Studies (Hans-Peter E. Kohler). 19. Biodegradation of Anthropogenic Organic Compounds in Natural Environments (Jose-Luis Niqui-Arroyo, Marisa Bueno-Montes and José-Julio Ortega-Calvo). 20. Phytoremediation of Soils Contaminated with Organic Pollutants (Jason C. White and Lee A. Newman). 21. Bioavailability of Hydrophobic Organic Contaminants in Soils and Sediments (Wesley H. Hunter, Jay Gan and Rai S. Kookana). 22. Abiotic and Biotic Factors Affecting the Fate of Organic Pollutants in Soils and Sediments (Richard E. Meggo and Jerald L. Schnoor).